Happy New Year, everyone! I hope you've started 2017 full of joy and excitement! What do you want to do this year? Is there anything you'd like to pursue this year? What is your 'Dharma' this year? 'Dharma' simply means 'what you meant to do in the world' or 'what/how you direct your focus'. I know, it's serious business ;-)! It's tough though because there are so many choices we can make. There are so many possibilities. We have so many things that we can offer the world. Also, 'Dharma' can be day to day simple choices. Let's say...if you are at the store looking for some alternative milk, you will find so many of them - almond milk, soy milk, coconut milk, rice milk, flax milk, oat milk with different brands, with or without sweetner...etc. OMG, there are so many, which one should I get, right? Or if you are looking for a yoga class to attend, you will find so many of them in town - different styles of yoga, different teachers, different studios...etc. So...to me, making a choice is reducing endless possibilities to fewer choices. You finally say 'Yes' to something and 'No' to a lot of different things. Often times, we get confused because there are limitless choices. Here is the good news. Yoga practice sharpens our focus. It teaches us that we have the freedom to make choices. We feel better in our own skin so we feel more comfortable with making our own choices. That is a gift from yoga and the invitation is open to us all the time! My Dharma is always the same - touching people's hearts through yoga. It is my true hope to help you heal in your physical, emotional, and spiritual body. There are so many fun events @ Shigeko YOGA this year! Did I say it loud enough? There are so many of them! Wind down and stretch your weekend! 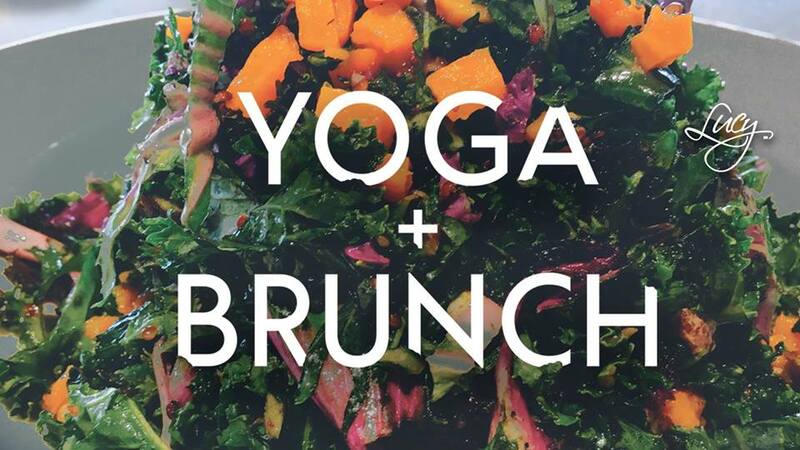 You'll do slow Sunday morning flow AND a mimosa with me for only $10! Call Lucy @ 720-274-6868 to save your spot and reserve a brunch table too if you like! Come get your yoga on at Lucy Restaurant! Meditation & Yoga Night : NEXT Friday, February 3rd @ Shigeko Yoga Studio @ 5:30-6:45 PM *5 students max. The rate is $15. The spots always sell out very quickly, so please let me know if you're interested! Join Shigeko Yoga and Kyla Bates Acupuncture and Herbal Medicine for this unique, interactive, and healing workshop! The workshop will combine two ancient and powerful health systems to improve and transform your life. You will learn specific yoga poses and breathing exercises and receive a mini-acupuncture treatment and nutrition session to promote more rejuvenation for the spring. This workshop is designed for immunity, deep cleansing, and a whole body spring renewal! To sign up, click HERE! Lower Back Pain is one of the most common medical problems, and a popular complaint among yogis. The medical community is consistently recommending yoga as a supplement to back pain relief or pre and post surgery treatment for a holistic approach. This workshop will help you look at how you move specifically in your hips/back areas from a different point of view. Understanding how to reduce and get out of pain requires an understanding of how the body moves and functions. You will notice your compensation patterns and learn how to work with and alleviate acute or chronic back pain through breath and therapeutic yoga postures. When you breathe better, move better, you feel stronger in your yoga practice and life! Why do you live with back pain? You can be back pain-free! To sign up, click HERE! I'll see you on the mat! Copyright © 2017 Shigeko YOGA, All rights reserved.